David Yona Bekker was born in Vilna, Lithuania in 1897. He studied art in the Antikolsky Academy of Vilna. 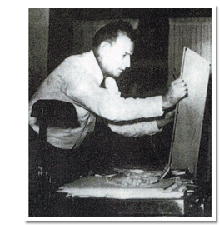 His father, Avraham Menachem Mendel Bekker, encouraged young David in his artistic leanings. * Recent research in the Vilna Archives indicates the year of birth as 1895.